Wed., 8 Jan. - Thu., 5 Mar. Tue., 7 Jan. - Wed., 19 Feb.
Wed., 8 May - Tue., 5 Nov. Sun., 1 Dec. - Wed., 25 Dec. Thu., 6 Feb. - Mon., 2 Mar. Mon., 9 Sep. - Mon., 21 Oct. Mon., 23 Sep. - Tue., 5 Nov. Sat., 4 Jan. - Wed., 19 Feb.
Wed., 20 Nov. - Wed., 4 Mar. Tue., 19 Nov. - Wed., 29 Jan.
Wed., 2 Oct. - Wed., 4 Dec. Mon., 30 Dec. - Wed., 26 Feb. Tue., 17 Sep. - Tue., 22 Oct. Tue., 17 Sep. - Tue., 19 Nov. Tue., 24 Sep. - Thu., 31 Oct. Tue., 7 Jan. - Mon., 17 Feb. Thu., 3 Oct. - Sun., 20 Oct. Mon., 14 Oct. - Sat., 30 Nov. Mon., 2 Sep. - Wed., 16 Oct. Thu., 5 Dec. - Thu., 12 Dec. Sun., 11 Aug. - Mon., 9 Sep. Mon., 3 Jun. - Wed., 18 Sep.
Fri., 1 Nov. - Sun., 24 Nov. Tue., 11 Jun. 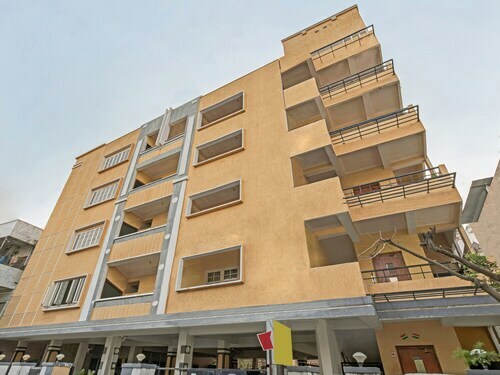 - Sat., 31 Aug.
See all 244 properties in Rajiv Gandhi Intl. Located near the airport, this family-friendly hotel is within 12 mi (20 km) of Wonderla Amusement Park, Charminar, and Salar Jung Museum. Chowmahalla Palace and Laad Baazar are also within 12 mi (20 km). 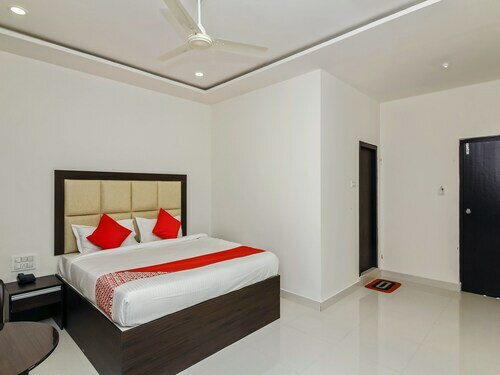 Situated in Hyderabad, this hotel is within 12 mi (20 km) of Wonderla Amusement Park, Nehru Zoological Park, and Charminar. Chowmahalla Palace and Salar Jung Museum are also within 12 mi (20 km). Situated in Hyderabad, this hotel is within 12 mi (20 km) of Nehru Zoological Park, Charminar, and Chowmahalla Palace. Sudha Cars Museum and Mecca Masjid are also within 12 mi (20 km). 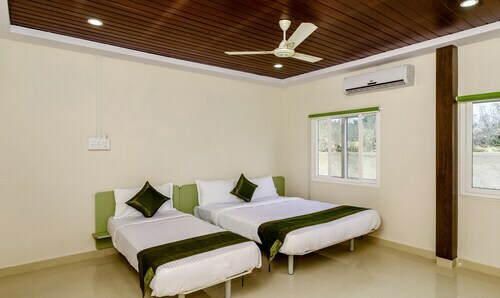 Situated in Hyderabad, this lodge is within 9 mi (15 km) of Nehru Zoological Park, Chowmahalla Palace, and Sudha Cars Museum. Charminar and Golconda Fort are also within 12 mi (20 km). 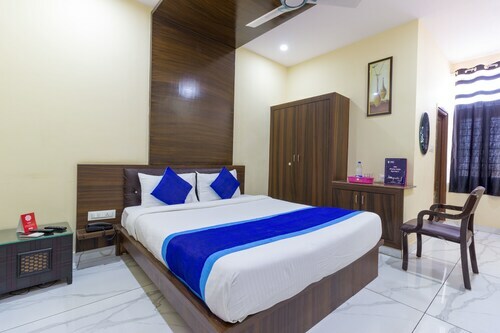 Situated in Hyderabad, this hotel is within 9 mi (15 km) of Nehru Zoological Park, Chowmahalla Palace, and Sudha Cars Museum. Charminar and Golconda Fort are also within 12 mi (20 km). 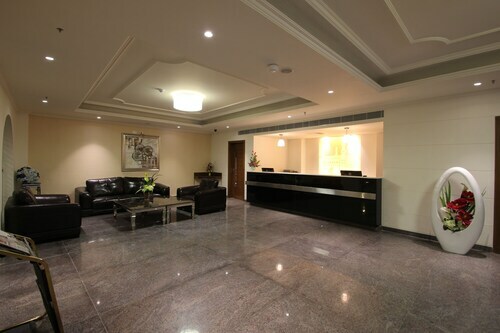 Situated in Hyderabad, this hotel is within 12 mi (20 km) of Nehru Zoological Park, Charminar, and Chowmahalla Palace. Salar Jung Museum and Abids are also within 12 mi (20 km). Situated in Hyderabad, this spa hotel is within 12 mi (20 km) of Nehru Zoological Park, Charminar, and Chowmahalla Palace. Abids and Salar Jung Museum are also within 12 mi (20 km). 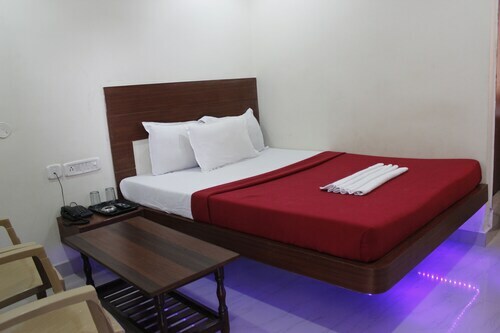 Situated in Hyderabad, this hotel is within 12 mi (20 km) of Nehru Zoological Park, Charminar, and Golconda Fort. Chowmahalla Palace and Abids are also within 12 mi (20 km). Question : How much is a plane ticket to Hyderabad (HYD) from Toronto (YYZ)? Answer : Cost can range anywhere from $1,096 to $6,094, prices for YYZ to HYD do change much more than most routes from Canada. However, usually the sooner you book, the better price you get. Answer : Yes, you can adjust your departure or arrival date. If you would like to save some funds in doing so, the lowest-cost day to fly in April is Monday. Having flexibility in your travel plans means you can save more, so be sure to plan ahead when possible. Question : What is the cheapest airline flying from Toronto to Hyderabad? Answer : Jet Airways (India) is the leader in keeping prices low for their passengers over the next three months. Bookings are being made at just $1,096, which is a great deal when compared to the high-end bookings of $6,094. Question : What is the cheapest date to fly to Hyderabad? Answer : As of Apr 15th, the cheapest day to fly from Toronto to Hyderabad is Apr 17th. Tickets are currently being sold for $1,096, which is 36% less than the average price. Answer : The cheapest day to fly from Toronto to Hyderabad is on Monday. So, if you are trying to save a little money on your next business trip look for flights on Monday. Question : How long do most people stay in Hyderabad on average? Answer : Of course, you are not most people, but if you were, you'd stay about 28 days.